Residential Medical Waste Services | D&O Garbage Service, Inc.
Oregon law prohibits syringe/needles (sharps) from being disposed and collected with regular garbage. 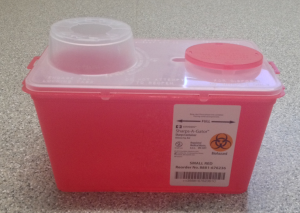 D & O Garbage Service provides a safety approved sharps container for this type of medical waste disposal. Small fee applies. Containers can be picked at our office or delivered.